A Covercraft Exclusive! WeatherShield® fabrics are fade resistant, shed moisture, stop dust, dirt and bird droppings, and are very water resistant and breathable. A truly high performance fabric. No microfibers, no laminates, no surface coatings….EPIC® by Nextec’s encapsulation process delivers all weather protection, compact packability, easy care, and a soft-to-paint touch without sacrificing breathability. 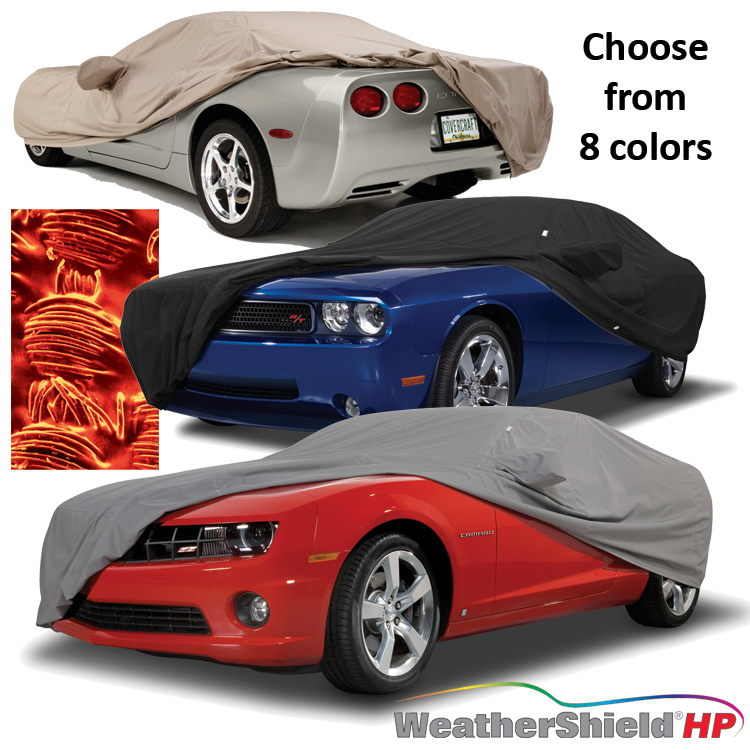 Eco Conservation Friendly - We protect your vehicle and your selection of this fabric helps to protect our environment! WeatherShield®HP (for "high performance") is manufactured with solution-dye fibers which makes fabrics more fade resistant and is currently one of the most ecologically responsible ways to produce fabric. Solution-dye isn’t really a dye process, the color pigments are mixed into the compound that is extruded as thread. This puts the color all the way through each fiber (fade resistant) and saves 1,000 gallons of water for every 1,000 yards of fabric produced since we don’t have to surface dye the fabric! Dramatic Rain Dispersion - Fabric sheds water as soon as it hits the cover. Easy Care - Wash and dry at home. Most mid-size covers will fit in home washers and dryers and, unlike non-woven materials, they can be thrown in a dryer. Durable Fade-Resistant Base Fabrics - Premium solution-dye fibers mean the covers resist fading and hold their color longer.